In our one-and-only four minute qualifying session I posted a time of 50.789, which was good enough to give me fourth! In the first race I started in fourth (due to qualifying). I didn’t get a very good start due to a few in front of me getting bad starts. So I lost a couple of positions at the first corner. But, unfortunately, at the second corner, three karts got tangled in front of me, I had nowhere to go, and went into the sand. As a result, I did not finish the race. In the second race I started in eighth, because all grids are based on points. At the start of this race I gained three places to move into fifth. 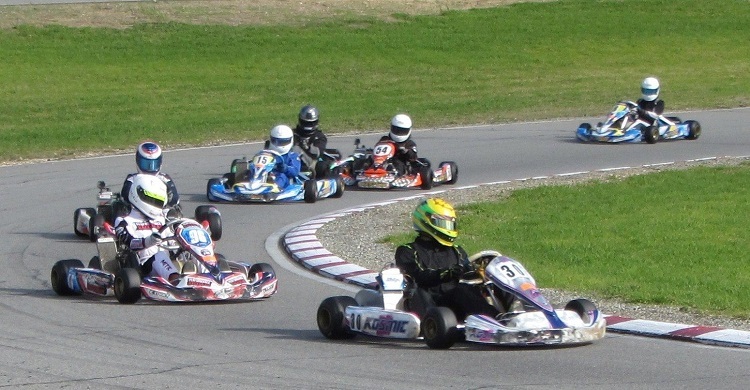 After this point, there wasn’t much position change; I was going at about the same pace as the leaders, and slowly pulling away from the karts behind. I crossed the line in fifth place. In the pre final I started in eighth. The track was damp, so two drivers were on wet tyres, whereas the rest were on slicks – I was on slicks. Unfortunately, I spun at the first corner, and dropped to last. But after two laps I caught up to eighth and made a move to give myself a position. About two laps later I caught and overtook sixth place, who was on wet tyres. Over the course of the race the track had become bone-dry, but on the last lap – whilst battling with fourth place, it started to rain. The driver behind me (who was on wet tyres) overtook me and the driver ahead, and I dropped to sixth, but crossed the line with fifth place a mere 0.021 seconds ahead! In the final race (where you finish in this is your position for the day) I started in sixth. At the start of this race I got into fifth. One lap later I dropped to sixth, but couldn’t catch or easily defend due to incorrect gearing on the kart. For the next eight laps I managed to retain sixth place, until, with two laps to go I was overtaken – this not only lost me a position, but gave fifth place a lead on us. I managed to get back past into sixth. But on the second last corner of the last lap, I lost a position and finished seventh.